← Will the group “socialism of the 21st century” survive? Bolivia’s “Aral Sea” … WTH?! 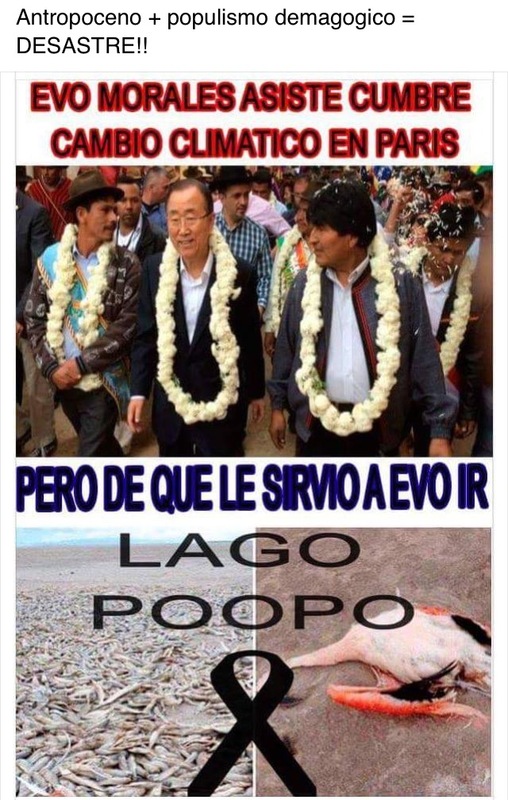 Irreversible damage was caused in the second largest lake in Bolivia: the Poopo Lake. Although it has caused a great impact and alarm, the disappearance of lake Poopó, in the Department of Oruro and the second largest in the country after Lake Titicaca, is not unexpected news. Reports and evidence, first of their degradation and pollution which altered its landscape and the balance of the species that habitually inhabited it; and then the gradual reduction of its waters up to the current situation in which virtually there are only some spaces with water, were reported by residents in recent years while this warning could provoke in the departmental or national authorities action in this regard. According to reports, they requested the dredging of the Desaguadero River, its left arm so that the Lake will feed, but unfortunately no task was performed. “Lake Poopó had the following dimensions: 84 kilometers long, by 55 wide, equivalent to a surface of 4,620 square kilometers and from the air now there is a mirror of water reduced to a minimum, which seems only a puddle in the middle of kilometers and kilometers of desert land”, says La Patria. This same newspaper mentions that “from the environmental disaster occurred in November 2014, when millions of fish were killed, lake Poopó not returned to accommodate aquatic species”. This dramatic evidence leaves the population who lived from fishing, in total vulnerability. Most migrated to other populations, and even to neighboring countries, such as Chile and Argentina, in search of work. It is, clearly, a process of gradual desertification, and when announcing that, it was amazingly ignored. Research suggests that this process occurred “as a result of mining activities and climate change”. No need to discuss the strength of both arguments; effectively desertification processes are an expression of the effects of climate change and contamination of water sources is the same accelerator. For this reason called attention to the importance of preserving wetlands. A wetland is an area of the Earth’s surface that is temporarily or permanently flooded, regulated by climatic factors and in constant interaction with the living beings that inhabits it. Thanks to their tissues, they store and release water, and thus contribute to feeding animal and plant species and combating soil erosion. Bolivia is part of the 168 countries that have acceded as a part of a contracting party to the Convention on Wetlands (Ramsar, 1972) since 1990; It has been designated as the country of the world with greater amount of wetlands and has eleven sites designated until 2013 – among which there is the Lake Poopo – which should be preserved. At the beginning of 2015, the Ministry of environment and waters (MMAyA) drew up a standard to preserve, use and take advantage of the wetlands of the country; “since these places can be a safeguard against drought and to live well”. It also announced the development of a national regulation of wetlands that includes measures for their preservation and sanctions for those who affect these ecosystems (usually opencast mining activities). For these reasons, it is contradictory and incomprehensible that despite the evidence, complaints and standards developed in this regard, environmental authorities have not been able to react even to regulate the intense mining activity in the area which, as it is well known, is one of the main responsible for this environmental disaster. The disappearance of an important and iconic Lake Poopo compels us to reflect, once again, on the incoherence between speech – and even laws – and the actions. We are a country that is becoming powerless witness of their own disasters, only complains and scares when – as it is the case with all environmental damage – it is too late. Crude reality and something that will haunt forever the Oruro-born president, that despite his self-proclaimed defender of Mother Nature, with TOTAL control of all State powers, has allied this to happen. The Bolivian “Aral Sea” will be his “best legacy” … no wonder he is regarded as the best expression of ochlocracy! This entry was posted in Bolivia, Environment, Social Unrest and tagged demagogue, environmental damage, Ochlocracy, Oruro, polluted lake, public policy failures. Bookmark the permalink.